Upgrade your MK5 GTI fuel pump today with the Autotech Hi-Volume Fuel Pump Upgrade Kit. Note: This is a DIY upgrade kit, not a replacement fuel pump. Upgrade the heart of the MK5 GTI fuel delivery system with the Autotech Hi-Volume Fuel Pump Upgrade Kit. This fuel pump kit swaps out the internals of the OEM fuel pump and replaces them with upgraded pieces from Autotech. Autotech is one of the best manufacturers of fuel pump upgrade kits for your MK5 GTI because their fuel pump kits offer the highest quality and solid engineered parts available while keeping their costs low. This DIY fuel pump kit by Autotech achieves flow rates 50% greater than the OEM fuel pump, basically eliminating fuel pump limitations. 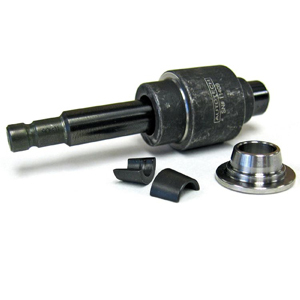 Autotech engineers the parts for the Hi-Volume Fuel Pump Upgrade Kit using a high-percision grinding process to ensure the proper tolerances are maintained throughout the whole manufacturing process. The Autotech Hi-Volume Fuel Pump Upgrade Kit is the perfect performance modification for your MK5 GTI no matter what stage of the modification process you're in. Note: This is a DIY kit. Must use OEM fuel pump with this kit. Every piston and cylinder used in the Autotech Hi-Volume Fuel Pump Upgrade Kit goes under multiple high-precision processes to ensure that each piece has the most precise tolerances and are maintained throughout the whole manufacturing process. All the cylinder and pistons are serialized and matched during the manufacturing process to guarantee that you are receiving precision pieces with the best durability. Each piece of the Hi-Volume Fuel Pump Upgrade Kit is plasma diamond-like carbon coating to reduce friction loss and increase performance. Autotech is the first company to incorporate this process successfully because they engineer their parts specifically to be diamond-like carbon coated. Many tuners worldwide now have Autotech Hi-Volume Fuel Pump Upgrade Kit specific mapping to take full advantage of their kit. This Hi-Volume Fuel Pump Upgrade Kit for the MK5 GTI is a medium to advanced-level installation. Specialized tools and modification to OEM equipment may be required.